Alongside their brand-spanking new TVs, LG and Samsung have packed some pretty nifty technology into the humble remote control. 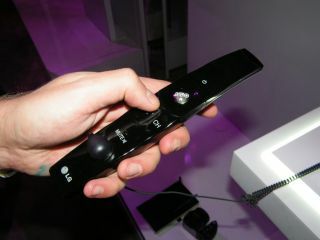 First-up, LG seems to have taken its inspiration from Harry Potter, creating a remote control which is shaped like a wand. Called the Magic Wand, the device acts like a Wii-mote for your TV and gives the user access to the company's Magic UI technology. Currently the Magic Wand is only available for the 8500 series, but LG is hoping to roll out the device over more of its range in the near future. To use it you just wave the wand at the TV and it will move a cursor on the screen. Once the cursor is on the section you want, then you click enter and away you go. You don't even have to mutter: 'Wingardium Leviosa' to make it work. Bonus. Samsung has decided to integrate a screen into its remote. The All-in-Premium Remote looks a lot like an iPod, with each feature of the TV appearing as a visual thumbnail on the screen. The best thing about the remote is that the screen will also show you just what you are viewing on your TV. So, if you need to go to the toilet, you can keep the TV on and watch the screen on the loo. It also acts as a media server, where you can get files from your PC to your TV. The All-in-One Premium Remote will be out this year and will come with Samsung's new 9000 series.